Registration: Registration for this workshop is now closed. You may be interested in Textile Marbling: A Workshop with Jamie Lea Berstch, Saturday, March 7 or Tapestry Weaving: A Workshop with Jamie Lea Bertsch, Saturday, March 21. Shibori is an ancient Japanese resist-dye technique that involves creasing, folding, binding, and knotting to create beautiful patterns. 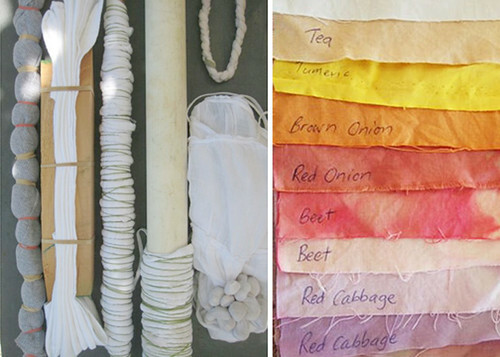 In this workshop, you'll begin by making the dyes (some of them sourced from your own kitchen or garden), and will then learn the basics of Shibori to make a scarf or set of striking tea towels. Bring a bag lunch and beverages and dress for the outdoors. We’ll be making use of Lynden’s 40 beautiful acres during our breaks, weather permitting. We have aprons, but please wear clothes suitable for artmaking. Jamie Lea Bertsch is a maker. Whether itʼs creating pattern, knitting, arranging flowers, or experimenting with natural dyes—making by hand is her favorite thing to do. She swoons over combinations of color, texture and pattern. Bertsch received her MFA in Fibers from the University of Wisconsin-Milwaukee and a BFA in Graphic Design and Printmaking from the University of Wisconsin-Stevens Point. She has traveled abroad, teaching art in Mae Sai, Thailand. Her design work has been featured in Domino Magazine and Wisconsin Bride, and she has shown her work at Lillstreet Gallery in Chicago and the Textile Arts Center in Brooklyn, New York.